Charles Henry Livingstone was born at Fremantle, Western Australia, in 1892. In 1912 he travelled to NSW, intending to see the eastern states before returning to his home at Harvey, WA. He was working in Sydney as a tram conductor when war broke out, and enlisted in October 1914, sailing as Trooper 663 with the 1st Reinforcements to 6 Light Horse Regiment. Livingstone landed at Gallipoli with his regiment on 20 May 1916, and served until the evacuation. He continued to serve throughout the Sinai and Palestine campaigns, and was awarded the Distinguished Conduct Medal for his actions near Dhaheriye, north east of Beersheba, on 3 November 1917. Livingstone was en route to Australia on ‘ANZAC leave’ when the war ended. 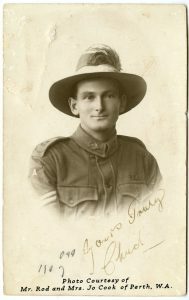 He was discharged with the rank of Corporal in January 1919, and after a brief period in Western Australia, returned to NSW, where he worked as a tram driver in Sydney for 40 years. In retirement, he moved to Tasmania to live with his daughter, and died at Launceston in May 1985. During our operations on the HERRON ROAD, early on the morning of 3rd November, 1917, this man was in charge of a Hotchkiss Rifle. The Country was very rough and difficult and during the previous night enemy snipers had moved in amongst the boulders to within 200- 300 yards of our day outpost line. For more than 2 hours, enemy fire kept Trooper LIVINGSTONE, and his two companions isolated, and although the two latter were killed beside him, Trooper LIVINGSTONE continued to work his Hotchkiss rifle and engaged the enemy at short range. His action assisted materially in the occupation of the line, that formed our objective and in the driving out of enemy snipers. The manner in which this man has handled his Hotchkiss rifle and team throughout the late operations has been beyond praise.